Lauren Billys and Jitter Bug. Photo by Jenni Autry. We’re excited to announce that Hannah Sue Burnett has acquired the ride on Jitter Bug, a 9-year-old Rheinland Pfalz-Saar mare previously owned and ridden by Lauren Billys. Hannah’s longtime supporter, Jacqueline Mars, purchased the mare for her to ride, Athletux announced today in a press release. “After getting a call from Liza Horan, who I trust a great deal, telling me I should take a look at her and then seeing video of Jitter Bug, I quickly jumped on a flight to California. After riding her, I was even more enthusiastic about her talent and our potential partnership,” Hannah said. Jitter Bug (Daimler D’ Adriers X Nesthöckerli, by Nickolson) has a strong record at the one-star level, with 2014 competition highlights include finishing third in the spring Galway Downs CIC*, third in the Rebecca Farm CCI* and seventh in the big CCI* class at Galway Downs in November. “Lauren has done a remarkable job producing her to this point, and the fact that I will have the opportunity to share this journey with Mrs. Mars, who has made countless things possible in my career, makes it all the more exciting,” Hannah said. 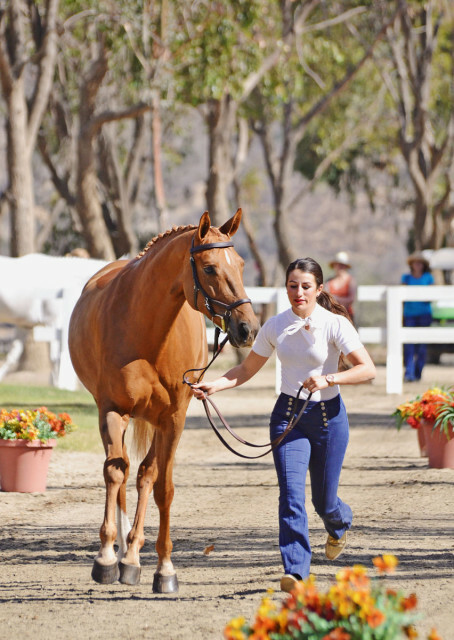 Lauren also recently sold another one of her horses, Ballingowan Ginger, in order to buy a more experienced mount to help achieve her goal of representing Puerto Rico at this year’s Pan American Games and the 2016 Olympic Games. “I am confident Hannah will do a fantastic job with Jitter Bug and look forward to seeing all of the great things they accomplish. I wish Hannah, Mrs. Mars, and of course Jitter Bug the very best in this new chapter,” Lauren said. Jitter Bug will join Hannah at her winter base at Oakmont Equestrian Center in Reddick, Florida, and she said she plans to spend some time getting to know the mare before getting her out to compete. We’re excited to see the partnership develop and wish Hannah all the best with Jitter Bug.